What if justice was a way of life instead of just an outreach strategy? It's possible to lead your church deeper into justice. Instead of outsourcing justice work to parachurch ministries, pastor Adam Gustine provides a renewed theological vision for the church’s identity as a just people, where God's character and the pursuit of shalom infuses every aspect of our congregational DNA. Becoming a Just Church shows church leaders how their congregations can become just, compassionate communities that restore shalom and bring hope to the world. Author Adam Gustine has also developed the Just Church Vision Retreat Kit, which provides all the resources pastors need to translate the book’s ideas to their particular church context. Complete with a reflection journal to engage with while reading the book, this kit also includes a personalized report from Adam based on a congregational assessment meant to inform ministry teams as they plan for their church’s future. Church leaders can use promo code JUSTKIT to buy 10 or more copies of Becoming a Just Church for just $9.00 each. Once you’ve made your bulk purchase you’ll receive all the components of the Vision Retreat Kit as digital downloads in your ivpress.com account page. Want to save when you buy the book but don’t need the entire Vision Retreat Kit? Use the same code, JUSTKIT, to purchase 1-9 copies of the book and you’ll still save, paying only $11 per copy instead of the retail price of $17. 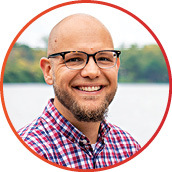 Adam L. Gustine leads CovEnterprises, a social enterprise initiative of Love Mercy, Do Justice, for the Evangelical Covenant Church. He is also the founder of Jubilee Ventures, an enterprise incubator in South Bend, Indiana dedicated to extending opportunity, restoration, and ownership to the margins. He has pastored multiple churches in a wide variety of contexts and has a doctor of ministry degree from Missio Seminary in Philadelphia, Pennsylvania.